Tools for hybrid programming such as thread/process placement support and performance analysis are presented in a "how-to" section. Hands-on exercises give attendees the opportunity to try the new MPI shared memory interface and explore some pitfalls of hybrid MPI+OpenMP programming. This course provides scientific training in Computational Science, and in addition, the scientific exchange of the participants among themselves. Georg Hager hold a Ph.D. in Computational Physics from the University of Greifswald. He is a senior researcher in the HPC Services group at Erlangen Regional Computing Center (RRZE) at the University of Erlangen-Nuremberg. Recent research includes architecture-specific optimization strategies for current microprocessors, performance engineering of scientific codes on chip and system levels, and special topics in shared memory and hybrid programming. His daily work encompasses all aspects of user support in High Performance Computing like tutorials and training, code parallelization, profiling and optimization, and the assessment of novel computer architectures and tools. His textbook “Introduction to High Performance Computing for Scientists and Engineers” is recommended or required reading in many HPC-related lectures and courses worldwide. In his teaching activities he puts a strong focus on performance modeling techniques that lead to a better understanding of the interaction of program code with the hardware. is head of Parallel Computing - Training and Application Services at HLRS. In workshops and summer schools he teaches parallel programming models in many universities and labs. Since 1996, he has been a member of the MPI-2 Forum and since Dec. 2007 he is in the steering committee of the MPI-3 Forum and was responsible for the new MPI-2.1 standard and in charge with the development of the new MPI-3 Fortran interface. In January 2012, the Gauss Center of Supercomputing (GCS), with HLRS, LRZ in Garching and the Jülich Supercomputing Center as members, was selected as one of six PRACE Advanced Training Centers (PATCs) and he was appointed as GCS' PATC director. * = F_30 for the new Fortran mpi_f08 module. with pure MPI code in the C and Fortran directories and the hybrid MPI+OpenMP Version in the solution sub-directories. 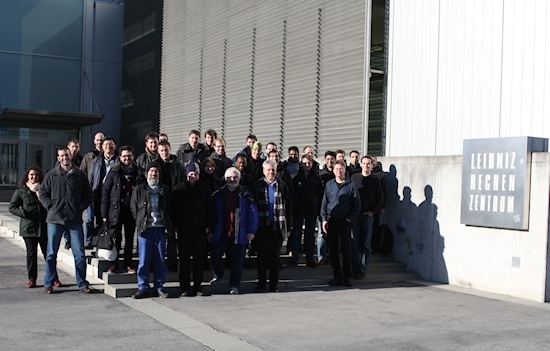 LRZ is part of the Gauss Centre for Supercomputing (GCS), which is one of the six PRACE Advanced Training Centres (PATCs) that started in 2012.